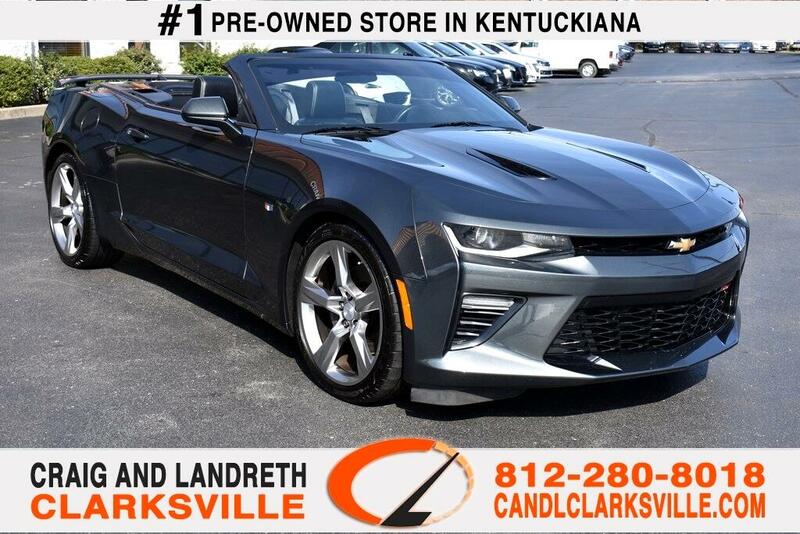 CERTIFIED BY CARFAX - ONE OWNER AND NO ACCIDENTS 2017 CHEVROLET CAMARO SS 1SS ** ONLY 24,000 MILES ** SUPER CLEAN CARFAX ** POWER CONVERTIBLE TOP ** PREMIUM LEATHER SEATS ** TOUCHSCREEN ** BLUETOOTH ** BACKUP CAMERA ** PREMIUM WHEEL PACKAGE ** NON SMOKER VEHICLE ** THIS CAMARO IS LIKE NEW AND DOESN'T NEED A THING AND THAT IS A GUARANTEE ** WHY PAY THE DIFFERENCE IF YOU CAN'T TELL THE DIFFERENCE?! WHY BUY NEW?! THIS CAMARO IS NEW AND HAS THE FULL FACTORY WARRANTY ** THIS CAR IS SITTING ON THE SHOWROOM FLOOR...... YOU WILL NOT BE DISAPPOINTED WITH ANYTHING ON THIS VEHICLE! ANY QUESTIONS CALL RICHARD SPAN, JAKE SMITH, OR JIMMY SMITH JR AT 812-280-8018!! WE'VE NEVER LOST A DEAL WHEN IT CAME TO PRICE OR QUALITY! !